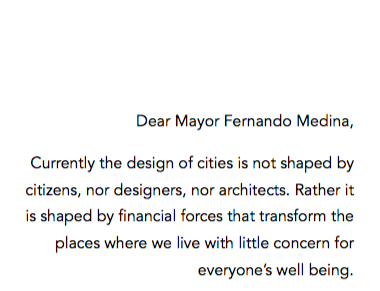 This is the beginning of my letter to the mayor of Lisbon, part of the event and exhibition 'Letters to the Mayor' curated by Ivo Poças Martins and part of the Lisbon Architecture Triennial 2016. All participants in this year's Triennial were invited to write a letter to the mayor of Lisbon expressing their concerns and/or desires about the city. 'Letters to the Mayor' is an initiative of the Storefront for Art and Architecture to catalyse the dialogue between designers and political authorities. Since 2014 this event has happened in various cities, such as New York, Panama City, Mariupol, Bogotá, Taipei, Athens, Mexico City, Buenos Aires, Madrid and São Paulo. If you wish to read my letter you may do it here. You can read all the letters at the city hall Paços do Concelho, until November 20 2016.